Critics rave. Audiences applaud. Standing ovations are commonplace. FAME � The Musical is a show not to be missed. For just two short weeks �REMEMBER MY NAME � FAME!� returns to Gauteng. Owing to public demand, the internationally acclaimed production of FAME � The Musical opens at the Nelson Mandela Theatre, Johannesburg Civic Theatre on Saturday, 07 February 2004 for a limited season ending on Sunday, 22 February 2004. Presented by Cell C and produced by Showtime Management in Association with Jacobsen Entertainment, Australia, FAME � The Musical enjoyed nightly standing ovations and rave reviews during its 2003 run at the Spoornet State Theatre in Pretoria. The ovations continue at every show since the production moved to the Cape Town International Convention Centre at the beginning of the 2003 Festive season. 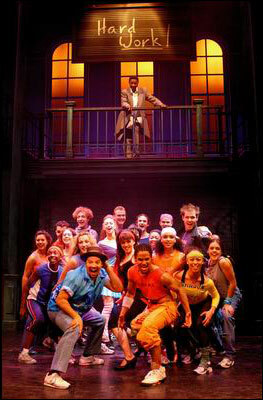 FAME � The Musical ends its highly successful Cape Town run on 31 January 2004, thereafter moving to Johannesburg. Tickets are available from Computicket outlets, Computicket Call Centres on 084 915 8000 or (011) 340 8000. To make online bookings, visit www.computicket.co.za . For block bookings and special groups rates contact the Johannesburg Civic Theatre �s VIP Ticketing Department on 011-8876854. For further information visit The Johannesburg Civic Theatre website at www.showbusiness.co.za . Set during the last years of New York City's celebrated High School for the Performing Arts, FAME charts the bittersweet but inspiring story of the roller coaster ride of a group of talented, star-struck students from differing backgrounds and cultures. The story line captures the dreams, struggles, disappointments, joy and romances of the colourful characters as they commit to four years of gruelling artistic and academic work. The story features four teachers whose characters are as diverse as their education values.